Food and travel are my two most favorite things. So when we go to Disney World, we have our favorite snacks that we can’t go back home without. I couldn’t get the kids to part with their Dole Whips too take a picture. A Dole Whip is a dairy-free soft serve frozen dessert. It comes in three flavors, but pineapple is the one you want. It’s my favorite. To be honest, I start my Disney World trip with a Dole Whip and have at least 3 during my stay. You can get it with pineapple juice as a float or as soft serve. Either option is a great choice, but I prefer the soft serve. Try it and you’ll soon see what all the hubbub has been about. You can get your Dole Whip fix both inside and outside the Magic Kingdom. Inside the park, head to the Sunshine Tree Terrace in Adventureland. Outside the park, head to Disney’s Polynesian Resort where they have a small shop that serves them. I make a really good copycat version at home. You can get the recipe for my Homemade Dole Whip here. I couldn’t eat a picture fast enough before the kids took a bite. This soft pretzel makes a great snack and is fairly inexpensive. Pus it’s large enough to share. 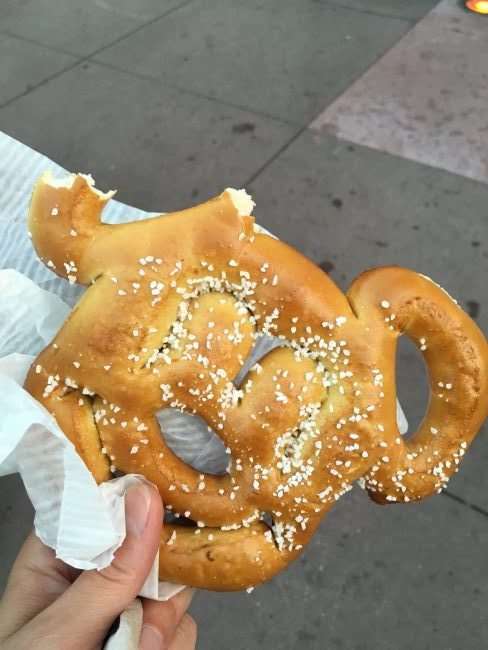 You can find Mickey Mouse Pretzels at each of the 4 Disney World Parks at kiosks/carts. You can find plain salted, cheese stuffed, and sweet pretzels. I usually pick one up in Disney’s Hollywood Studios in the Center Stage area near the Great Movie Ride and in Magic Kingdom’s Tomorrowland at the Lunching Pad quick service restaurant. I can a copycat recipe for Mickey Pretzels here. This is a traditional Norwegian sweet roll that is infused with cardamom and filled with vanilla custard and topped with shredded coconut. You could eat this all my yourself, but it’s better to share the love. Each bite is delicious!! A trip to EPCOT isn’t complete with one of these. 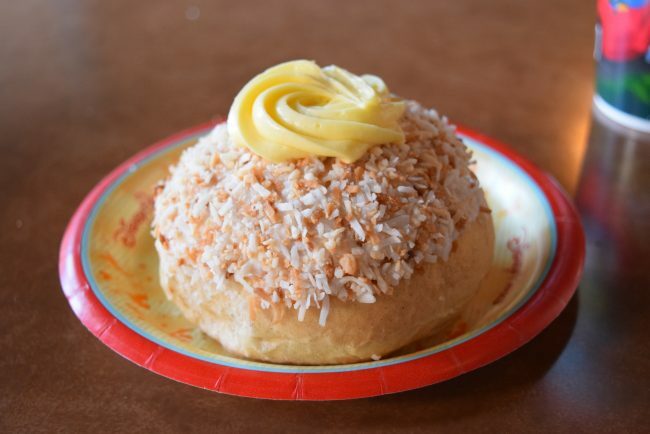 Find School Bread in EPCOT’s Norway Pavilion at the Kringle Bakeri Og Kafe. Get a Norwegian coffee to go with it and you’ll be in heaven. Are you seeing a theme to these snacks yet? All the walking you do at Disney World allows you to indulge a little. You can’t go wrong with anything at the French Bakery inside EPCOT’s French Pavilion. From the sandwiches on fresh baguette to the chocolate desserts, everything is sublime. On our last trip to attend the Disney Social Media Moms Conference, we tried the Macaron for the first time. 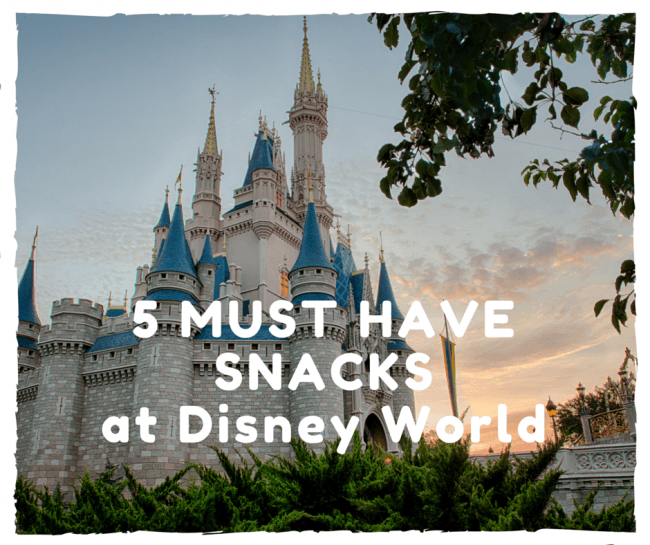 It made my list of must try snacks at Disney World. It was that good! This macaroon is a light meringue cookie with sweet lemon filling in the center, and fresh raspberries. It’s larger than a traditional macaron, but you’ll enjoy every bite. 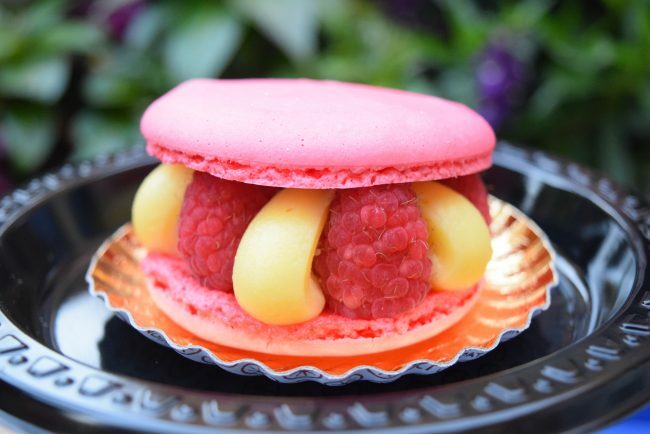 Find in EPCOT’s French Pavilion at the Les Halles Boulangerie-Patisserie. This isn’t really a snack, but although breakfast is the most important meal of the day, we tend to snack and have a light breakfast. 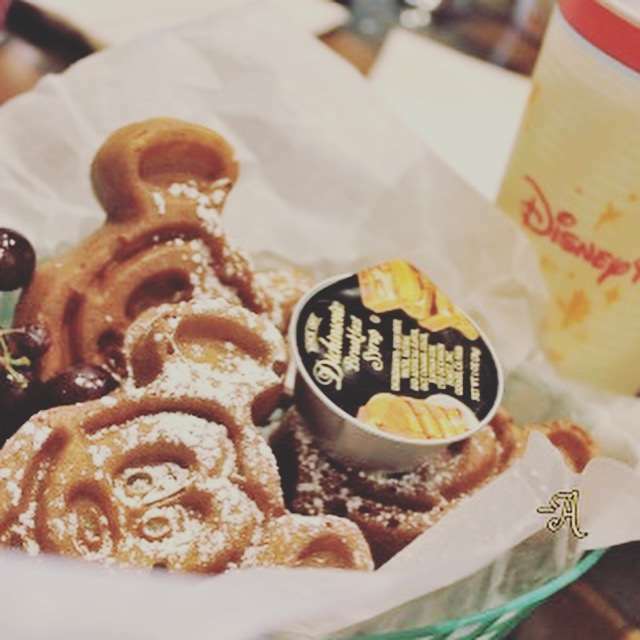 This Belgian waffle shaped like the iconic mouse is a great way to start off your whole Disney vacation! Get one plain, with powdered sugar, maples syrup, chocolate, Bananas Foster waffles, with fruit topping, etc. There are so many different Mickey waffle combinations that you could eat one a day during your vacation and still not try them all. You can find Mickey Mouse Waffles in small and large sizes all over Disney World at various resorts. Favorite spots include Captain Cook’s at the Polynesian Resort, Landscape of Flavors at the Art of Animation Resort (Buckwheat waffles), and Whispering Canyon Cafe at the Wilderness Lodge (waffles with candied pecans). Want a copycat recipe for these Belgian Waffles? Try this waffle recipe. These are just the first 5 Must Try Snacks at Disney World. There is so much great food to enjoy at Walt Disney World in Florida. On your next trip, give these a try and see why we can’t go home with having at least one of each. 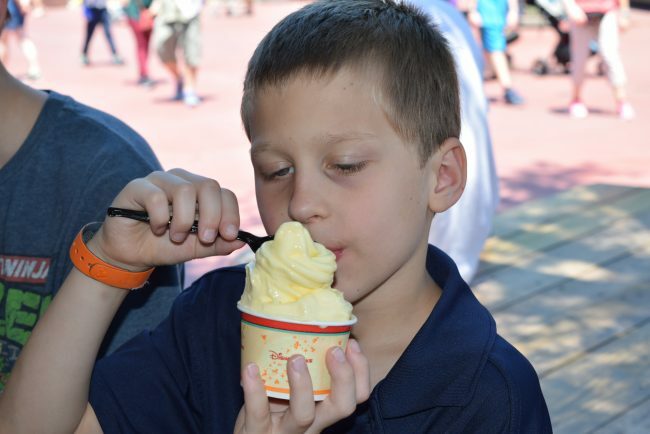 What are your “Must Try Snacks” at Disney World? Let us know in the comments below. All that food looks so fun to eat! 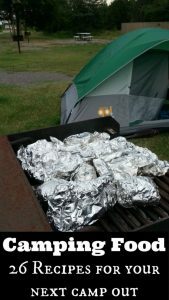 Your family looks like it had a great time! How do you eat the Macaron? Take it apart or one big bite? Is it messy to eat as in you take one big bite and it crumbles and the fruit falls on your shirt. Thanks for your advise. I don’t think there is a right or a wrong way to eat a macaroon. I ate mine like a cookie sandwich. The cookie literally melts in your mouth because it’s a meringue. The filling in these was thick and wasn’t messy at all. The fruit stayed put too. It was soooo good. Wow! This is a great source for planning our next trip! Thank you for doing the heavy lifting to make our Disney experiences easier and better.